Nearly 7 years into the recovery from the Great Recession, two glaring problems remain in the U.S. economy. One is a significant slowdown in the growth of productivity (the amount of output and income generated in an average hour of work). The other is the destructive rise in income inequality in recent decades due largely to big corporations and the wealthy rewriting the rules of the economy to stack the deck in their favor. This inequality has prevented the fruits of productivity growth from “trickling down” to reach most households—and has undermined the ideal of providing genuinely equal opportunity for all. Expanding public funding for home visits by trained nurses to help expectant parents make healthy choices both before and after childbirth. Providing resources necessary to ensure all families can access high-quality child care with well-trained, professional staff qualified to provide early childhood education. High-quality programs will aim to nurture children’s cognitive and socioemotional development and allow all children to enter their formal schooling years at comparable levels of preparedness. Providing resources to ensure the professionalization of early childhood caregivers and teachers. This means providing enough resources to attract and retain well-credentialed staff and to close earnings gaps between early childhood workers and other workers with similar skills and credentials (including K–12 teachers). There are many models of successful widespread implementation of these types of investments, and research clearly demonstrates such investments would provide high societal returns. American productivity would improve with a better-educated and healthier future workforce, inequality would be immediately reduced as resources to provide quality child care are progressively made available to families with children, and the next generation would benefit from a more level playing field that allows for real equality of opportunity. What is missing is the political will to provide these resources to all American families. 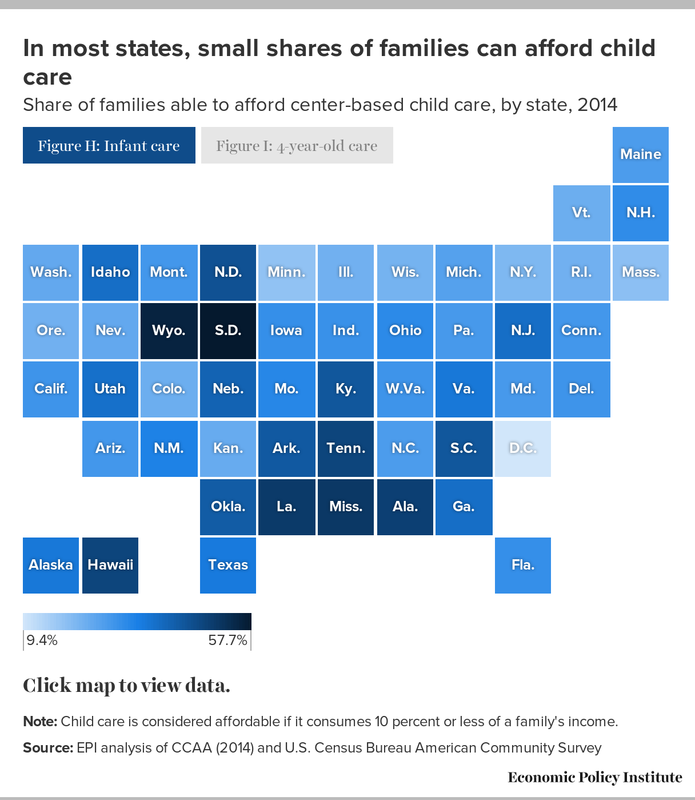 How much is child care in your state? Find out the real cost of child care across the country. The benefits accruing directly to the children receiving greater care and educational resources are large and progressive, as higher-income families are much more likely to already be able to afford high-quality child care and educational opportunities. The benefits stemming from greater investments in children are also universal, leading to an increasingly productive workforce that will boost economic growth, provide budgetary savings at the state and federal levels, and lead to reductions in future generations’ involvement with the criminal justice system. These benefits will, of course, materialize only in coming decades when today’s children have grown up. But the research is clear that they will materialize—and when they do, they are permanent. Achievement gaps between American students in different income classes, and between students of different races and ethnicities, appear before kindergarten begins, and sometimes peak at ages 5 and 6. This means early childhood care and education (ECCE) has a potentially large role in shaping these gaps. According to McKinsey researchers, the potential benefits to closing educational achievement gaps between students of different income classes total nearly $70 billion annually. The same researchers have further estimated that the payoff to reducing average test score gaps between American students and students in better-performing national school systems stands at nearly $180 billion annually. High-income families spend much more on child enrichment activities than do low-income families—and the gap has grown over time. For example, in 1970 the spending gap between the highest and lowest household income fifths was roughly $2,700. By 2006, it had grown to $7,500. Gaps in the absolute level of investments in children’s enrichment activities by income class have grown substantially over time, even as lower-income households increased their spending on these activities at a more rapid clip when measured as a share of income. In essence, lower-income households are making a greater investment effort, but the rise in income inequality has allowed higher-income households to pull away even without increasing the share of income they devote to children’s enrichment. The gaps in parental investment are firmly linked to achievement gaps in young children. Parental involvement in enrichment activities is a significant positive determinant of test score achievement. This provides a clear lever for ECCE investments that free up resources (including parental time) to make a major dent in achievement gaps. A solid research base has identified major benefits from specific ECCE interventions. For infants and very young children, programs that send nurses to pregnant mothers and mothers of infants to provide parenting advice and health monitoring have been linked to better scholastic achievement and later life outcomes for children. In countries that have provided subsidies for high-quality very early child care, similar improvements in children’s academic and later life achievement have been documented. Because early child care and education are huge expenses for nearly all families with young children, the case for providing subsidies for quality child care and education seems strong. This case is strengthened by the fact that such investments would pay dividends down the road in addition to immediately improving families’ living standards. And the direct economic benefits of providing such in-kind aid and removing a portion of child development costs from family budgets can be considerable. For a family that had an infant and a pre-kindergarten-age child and that earned the state median income for families with children, the median benefit from such a reform would be about $11,000 (received by families in Florida). For a family that had an infant and a pre-kindergarten-age child and that earned just half the state median for families with children, the median state benefit would be about $16,000 (received by families in Kansas). A prime impediment to a career for families with young children is a lack of high-quality child care possibilities. And it’s an unfortunate fact of culture, history, and past policy decisions that this curtails women’s labor force opportunities to a much greater degree than men’s. The benefits of boosting women’s labor force participation through the provision of more and better child care access and affordability are potentially enormous. Women are, of course, half of the potential workforce, and each 1 percent boost in the overall workforce increases total national income by 1 percent, or roughly $180 billion. If women’s labor force participation in the United States matched that of America’s international peers, the potential gains to gross domestic product (GDP) could be enormous—up to $600 billion annually. Providing affordable, high-quality child care should be a core component of any strategy to boost women’s labor force participation. An investment that capped child care expenditures at 10 percent of family income could increase overall women’s labor force participation enough to boost GDP by roughly $210 billion (or 1.2 percent). The additional tax revenue and reduced public outlays associated with higher GDP stemming from higher women’s labor force participation could provide roughly $70 billion in economic resources to governments to help finance the investment in ECCE. Currently, providing early child care in the United States is low-wage work. This is largely because the workforce lacks meaningful labor standards and protections. Further, even with its current low-wage workforce, the cost of early child care and development is large relative to the budgets of typical American families, principally because this work is labor-intensive and there is little scope for traditional strategies to lower costs without sacrificing quality. To put it simply, while crowding more and more children into each room with a caregiver and teacher would normally register in economic statistics as a productivity improvement, this is clearly not a serious strategy for improving early childhood care and development. By providing incentives to boost pay and training for early child care providers, a major investment in America’s children would also lift wages in this key economic sector. Many of these gains would accrue to the workers themselves, but the higher-quality workforce that would result from attracting and retaining more and better job seekers and incentivizing training would also result in higher-quality care. A key strategy for retention will be closing the wage penalty that currently exists between early child care and development workers and workers in other sectors with similar skills and credentials (including teachers in the K–12 sector). The current U.S. child care workforce is strikingly low-paid and lacks bargaining power to boost their pay and raise standards in the profession. In 2014, for example, the median wage of child care workers was $10.31, or 39.3 percent below the median in other occupations. The low pay of child care workers and the low level of investment in their training are barriers to providing high-quality child care. Well-compensated employees and investment in staff are key contributors to the most successful ECCE strategies. The following four sections examine the economic evidence and logic behind each of the four tranches of benefits that investments in ECCE provide. This is followed by an overview of the American status quo of helping families with children obtain access to quality child care. It finds that while a number of different policies and programs aim to help American families along these lines, these efforts fall short in terms of affordability, access, and quality. This highlights the need for a major investment in America’s children that could realize the potential benefits we identify. The largest and most enduring benefits of a major investment in childhood care and development are those stemming from its direct impact on children. The evidence is clear: Children with better early childhood care and educational opportunities grow up to be more likely to work and less likely to interact with the criminal justice system. They grow up in better health and earn higher wages. They pay more taxes and draw on fewer government resources. While many of these benefits only become apparent once the first wave of children enter adulthood, these benefits are large—and they persist and grow in successive generations so long as the investment effort is maintained. Lynch and Vaghul (2015), for example, review evidence on the economic benefits from a major investment that would provide universal high-quality pre-kindergarten education to all American 3- and 4-year-olds. Over a 34-year window (between 2016 and 2050), they estimate annual benefits from this investment would total roughly $10 billion. It is important to note that even these large benefits still leave many potential benefits on the table. The full potential economic payoff from a major investment in America’s children would occur if achievement gaps were eliminated between American students of different income classes, or different races and ethnicities, or even between average American students and students in higher-performing national educational systems in other advanced economies. McKinsey (2009) has estimated that closing achievement gaps between low-income students and others would boost GDP by roughly $70 billion annually. They further estimate that closing achievement gaps that persist between students of different races and ethnicities would boost GDP by roughly $50 billion annually. Further, if a major investment in America’s children also boosted the average performance of American students, payoffs would be even larger. For example, McKinsey (2009) estimates that closing the gap in average educational achievement between American students and students in higher-performing national educational systems could boost U.S. GDP by roughly $180 billion annually. The Lynch and Vaghul (2015) and McKinsey (2009) estimates together indicate that just one major component (high-quality pre-kindergarten for 3- and 4-year-olds) of an ambitious investment effort in America’s children could potentially provide a payoff equivalent to eliminating over a tenth of the achievement gap between students of different income classes. This indicates, among other things, that we should not restrict our investment effort in childhood development and education to any one strand of interventions, but should instead pursue an ambitious and varied portfolio of policies. Benefits to children stemming solely from enhanced access to quality early child care have not been translated into monetary terms as often as have benefits stemming from expanded early childhood education. As is discussed in the next section, evidence clearly shows the latter would have large positive societal effects. A less-robust but still convincing body of research suggests expanding access to early child care may also have potentially large positive impacts. To understand why, it is crucial to note that the previously discussed income-based achievement gaps are present even before children enter kindergarten. 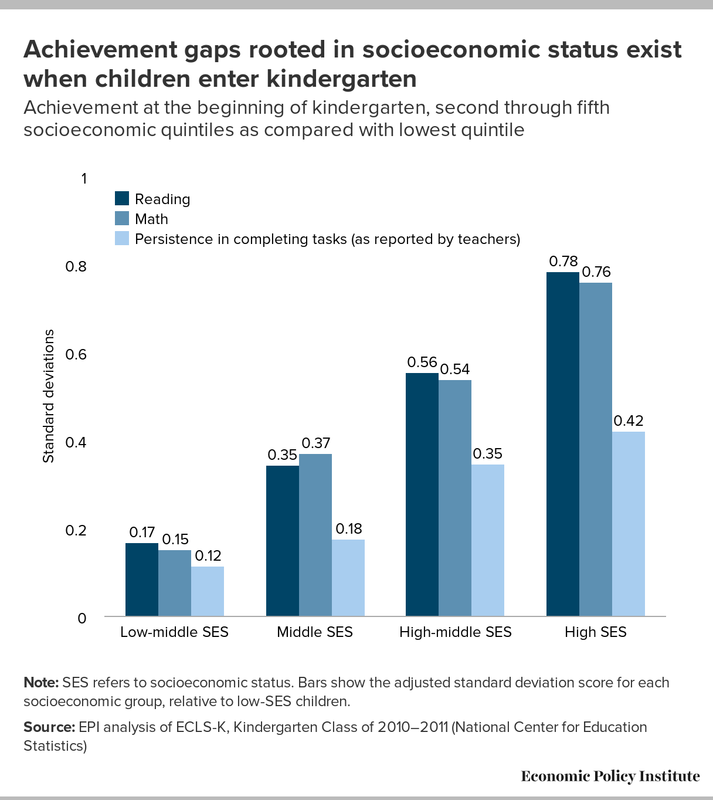 Figure A shows gaps in a number of average measures of achievement and school readiness among kindergarteners of different socioeconomic statuses. The figure shows test results from assessments of math and reading as well as teacher-reported summaries of “persistence in completing tasks.” Each assessment is measured relative to the bottom socioeconomic status fifth, and in all cases achievement and school readiness rise steadily as socioeconomic status rises. Note: SES refers to socioeconomic status. Bars show the adjusted standard deviation score for each socioeconomic group, relative to low-SES children. 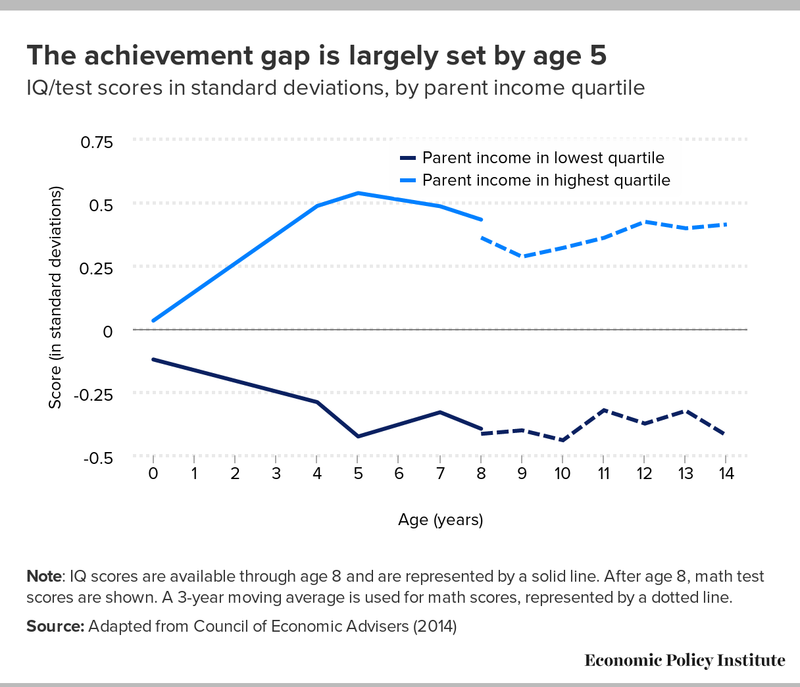 Perhaps even more strikingly, there is very little movement thereafter in achievement gaps across income groups relative to the size of these initial gaps that appear in kindergarten. Figure B replicates a figure used in a recent report by the Council of Economic Advisers (2014) showing measures of IQ scores through age 8 and measures of math test scores after age 8 for children from families in the highest and lowest income quartiles. The IQ gaps essentially peak in kindergarten, and math test score gaps are nearly stable over most of the years between ages 8 and 14. The clear implication is that the income-based achievement gaps highlighted in Figure A tend to persist throughout childhood—highlighting again just how crucial early childhood education and development are. Note: IQ scores are available through age 8 and are represented by a solid line. After age 8, math test scores are shown. A 3-year moving average is used for math scores, represented by a dotted line. These achievement gaps are mirrored in gaps in different income classes’ parental investment of time and money on childhood development. For example, the Council of Economic Advisers (2014) documented that both mothers and fathers in high-income families spent substantially more time engaged in educational activities with their children. Garcia (2015) shows that such enrichment activities with parents are positively associated with greater cognitive and non-cognitive achievement in kindergarteners. The extent to which higher-income parents are increasingly able to invest more money in educational and enrichment activities is depicted in Figure C, which uses data from Duncan and Murnane (2011). It shows that the spending gap between the highest and lowest household income fifths widened from about $2,700 in 1970 to roughly $7,500 by 2006. One of the most distressing aspects of this large and growing gap is that it has widened even as lower-income families have increased the share of income devoted to these expenditures much more rapidly than higher-income families. Essentially, families in the lowest income classes have increased their investment effort in childhood development more rapidly than families with higher incomes. But because increasing income inequality has channeled so much more money to these higher-income families, the absolute level of resources devoted to children has become increasingly unequal. 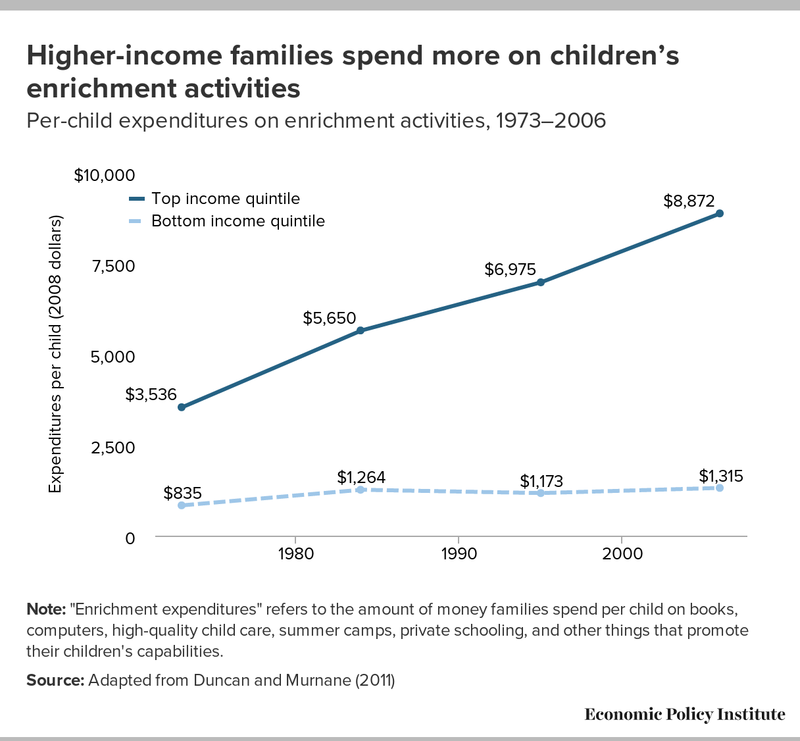 Note: "Enrichment expenditures" refers to the amount of money families spend per child on books, computers, high-quality child care, summer camps, private schooling, and other things that promote their children's capabilities. In short, gaps that appear in kindergarten—and which are hence (at least in part) the result of investments in very young children’s development—tend to persist throughout children’s lives. Thus, if we want to reap the enormous potential benefits of closing income-based achievement gaps, we need to equalize resources available to young children even before they begin traditional elementary school. This includes investing in quality early child care and early childhood development activities. For example, as Figure B showed, measures of children’s cognitive and non-cognitive skills begin diverging reliably across income classes even before ages 3 and 4. This leaves considerable room for even earlier childhood interventions than pre-kindergarten to help close achievement gaps. Further, some very early interventions, such as the Nurse Family Partnership (which provides first-time, unmarried, low-income mothers with home visits during pregnancy through the child’s second birthday), are associated with higher cognitive abilities at age 6. Exposure to the Nurse Family Partnership was also associated with better language and math skills at age 12.3 Additionally, Black, Devereux, and Salvanes (2011) have shown that Norwegian expansions of child care subsidies led to improved academic achievement by recipients, as well as decreased receipt of cash transfers and increased labor force participation in adulthood. Given the stakes involved in closing persistent income-based achievement gaps, the links between these gaps and parental investment in time and expenditures, and the evidence that some specific early interventions are associated with shrinking achievement gaps, a major effort aimed at equalizing resources and quality child care options for children even younger than age 3 should be a primary part of any major national investment in America’s children. As noted above, the estimated benefits of ECE investments are exceptionally large—and the research supporting this conclusion is robust. The benefits primarily stem from how these investments would equalize resources among children of different income classes. As such, they would unambiguously boost economic and educational mobility. A truly ambitious investment in America’s children could also conceivably raise the average level of educational achievement, and not just close achievements gaps without lifting this average. But most of the benefits would still accrue to children who are relatively resource-deprived, thereby enhancing their economic mobility. Because the most immediately recognizable benefit conferred by participation in high-quality early childhood education is a gain in standardized-test scores, these are widely measured in studies of several such programs. The easiest way to compare results of ECE programs across studies is to scale the benefits in terms of standard deviation increases associated with participation. This is because the outcome variable in most of these studies is not the same; different studies examine student achievement on different tests. We can compare results among different tests by translating findings into standard deviations. This measure shows the test score increase associated with various interventions as a share of the typical variance among scores. In the realm of test scores, one standard deviation is an enormous difference. For example, the standard deviation of 2014 college-bound seniors’ SAT scores was 322 (College Board 2015). A gain of this magnitude would move a test-taker’s score from the median (about 1490) to the 82nd percentile (about 1810). Two major meta-analyses provide conclusive evidence that high-quality early childhood education is associated with improved test scores. One study (Camilli et al. 2010) examined over 120 U.S. studies since 1960 and found consistent evidence that having participated in preschool the year prior to entering kindergarten was associated with large positive effects (0.23 standard deviations) on cognitive outcomes. Another study (Duncan and Magnuson 2013) suggests even larger effects, with early childhood education associated with score gains of 0.35 standard deviations. Detailed studies of lasting gains resulting from exposure to the Chicago Child-Parent Center (CCPC) in the 1980s have shown that large-scale publicly run programs can deliver real benefits comparable to those provided by smaller “model” programs, so long as teacher training and support are strong, there is a quality, age-appropriate curriculum, and parents are engaged. This helps allay concerns about “scalability” that have plagued analyses of smaller-scale ECCE interventions (for more on the components of successful early childhood educational interventions in large-scale programs, see Reynolds et al. 2011). More recently, studies of state-level pre-kindergarten programs have reported gains in scores for participating students (compared with their non-participating peers). Oklahoma’s universal pre-kindergarten program illustrates that a universal program (versus a targeted program) can yield significant returns not only for low-income children, but for all children. Offered to all 4-year-olds since 1998, it currently serves all but a few school districts.5 An evaluation of the program found statistically significant effects on literacy (Wong et al. 2008). Using data from the Tulsa, Oklahoma, program, studies have shown significant impacts on kindergarten outcomes of between 0.2 and 0.5 standard deviations in different pre-reading and math outcomes for two different cohorts, one in preschool during 2001–2002 and the second during 2006–2007 (Hill, Gormley, and Adelstein 2015; Gormley, Phillips, and Gayer 2008).6 While the benefits are greatest for the most disadvantaged children, all participants reaped significant benefits (Barnett 2008). New Jersey’s Abbott Preschool Program constitutes an important benchmark both for high quality and for continuous improvement. It started in 1999–2000 and currently serves all children in 31 high-poverty communities and about 19 percent and 29 percent, respectively, of the state’s 3- and 4-year-olds (Barnett et al. 2015). Basic program standards include a maximum class size of 15, teachers with certification in early childhood education, assistant teachers in every classroom, support services for children and families, and a developmentally appropriate curriculum that fully addresses the state’s learning standards (Barnett et al. 2013).7 Program effects persist over time, and are larger for children who participated in the program for two years than for one year. Using data from a cohort that completed preschool in 2004–2005, Barnett et al. (2013) estimate that test score gains in fifth grade from one year of preschool education are equivalent to about 10–20 percent of the achievement gap between white and minority students. Two years of preschool participation results in gains equivalent to 20–40 percent of the gap (Barnett et al. 2013). North Carolina’s Smart Start Initiative complements its More at Four preschool program for 4-year-olds. Established in 1993, the initiative takes a comprehensive approach, offering child care and education, as well as health and family support, for children from ages 0 to 5 (Ladd, Muschkin, and Dodge 2014). By the time participating students reached third grade, the Smart Start Initiative had generated gains equivalent to two to four months of instruction in math and reading, respectively (Ladd, Muschkin, and Dodge 2014). Will these test score gains fade over time? One concern regarding ECE’s effects on student test scores is the potential for these benefits to diminish over time. Two comprehensive meta-analyses of quality studies report that such fadeout is common, but that its economic and social impacts are easy to overstate. Leak et al. (forthcoming) and Duncan and Magnuson (2013) estimate that test score gains associated with high-quality pre-kindergarten decline by about 0.03 standard deviations a year. However, even statistically significant estimates of fadeout do not mean that such programs do not have large positive social returns. Heckman et al. (2010) and Heckman and Kautz (2012) find that gains in social and emotional skills (versus the traditional cognitive skills presumably captured in test scores) obtained in pre-kindergarten programs continue to benefit participants through their adulthood. Shonkoff and Phillips (2000) and Heckman (2008) similarly find that earlier investments establish strong foundations important to children’s later development, and that these benefits are not adequately captured in test scores. Evidence from studies evaluating the federal Head Start program reinforces this finding. For example, while the at-risk 3- and 4-year-olds who participate show substantial short-run gains (up to 0.25 standard deviations on cognitive outcomes after nine months in the program), test score improvements largely fade after a few years. Yet long-term studies of Head Start participants indicate that the students are more likely to graduate from high school and less likely to commit crimes. Strong evidence also demonstrates that ECE has substantial effects on children’s eventual employment outcomes and earnings. Children who participated in the Perry Preschool Project (a program in the 1960s that provided at-risk children with high-quality preschool) and who were exposed to the Chicago Child-Parent Center were all followed through early adulthood, allowing a comparison of outcomes among adults who participated in the programs in their early childhood and those who did not. Adults who had participated registered increased earnings compared with those who did not participate (Nores et al. 2006; Belfield et al. 2006; Reynolds et al. 2002; and Reynolds et al. 2011). Economists find that these gains are the result of a combination of higher rates of employment and higher earnings. There are a host of other benefits associated with exposure to early childhood education. The largest benefits are associated with reductions in criminal activity, but a range of other benefits are also identified. Both “model” programs (the Perry Preschool Project and the Chicago Child-Parent Center) as well as the very large-scale Head Start program are associated with significant reductions in the odds of pre-kindergarten program participants’ eventual criminal activity/involvement in the criminal justice system as adults, when compared with their non-participating peers. At age 40, Perry preschoolers had considerably lower rates of lifetime criminal activity than nonparticipants, including felonies for violent assault, drug sales, or property theft (Nores et al. 2005).8 At age 26, CCPC participants’ rates of felony arrests and substance abuse were 25 percent and 24 percent lower, respectively, than those of nonparticipating children (Reynolds et al. 2011).9 At age 18, the juvenile arrest rate differences were even more significant for CCPC participants: The number of juvenile court petitions was 42 percent lower in the treatment group versus the comparison group. Improved health outcomes are additional benefits that accrue both to individual graduates of various pre-kindergarten programs and to society. At age 40, when compared with their nonparticipating peers, the shares of Perry participants who reported health problems or having been treated for substance abuse were 9 percentage points and 12 percentage points lower, respectively (Nores et al. 2005). At age 26, when compared with their nonparticipating peers, CCPC participants had a 26 percent lower rate of reported depression symptoms, a 24 percent lower substance use rate, and higher health insurance rates (Reynolds et al. 2011). For all of these reasons, an ambitious investment in high-quality early child care and education would benefit children—and ultimately society as a whole. Child care reform that substantially reins in parents’ out-of-pocket child care costs through providing subsidies, while enforcing high standards in the quality and pay of child care workers, can provide significant returns not only to the children who receive that care (as described in previous sections), but also to parents, their families’ well-being, and the economy as a whole. Many important benefits provided by our social insurance and safety net programs come in the form of in-kind benefits to households to help them afford specific goods and services. Food stamps, Medicaid, housing vouchers, and even energy cost assistance are programs that provide such in-kind resources to low-income families. Given that such families’ budgets are stretched thin, these in-kind benefits are essentially fungible with cash and provide huge assistance. The practice of providing subsidies for specific in-kind services even for families well above the poverty line has been greatly expanded by the Affordable Care Act (ACA), which provides financial help to afford health insurance to families earning a full 400 percent of the federal poverty line. Child care subsidies are a simple resource transfer to low- and moderate-income families with children, who currently either find child care entirely out of reach, or who struggle to find room for high-quality child care in their budget. A child care reform proposal that caps the amount families would be required to pay as a share of their total family income, and fully subsidizes the remaining costs, would free up substantial resources to not only make child care affordable, but also to allow families to pay for other necessities that may have previously been neglected. These necessities may include rent, food, health care, and savings for a rainy day, for retirement, or for their children’s education. 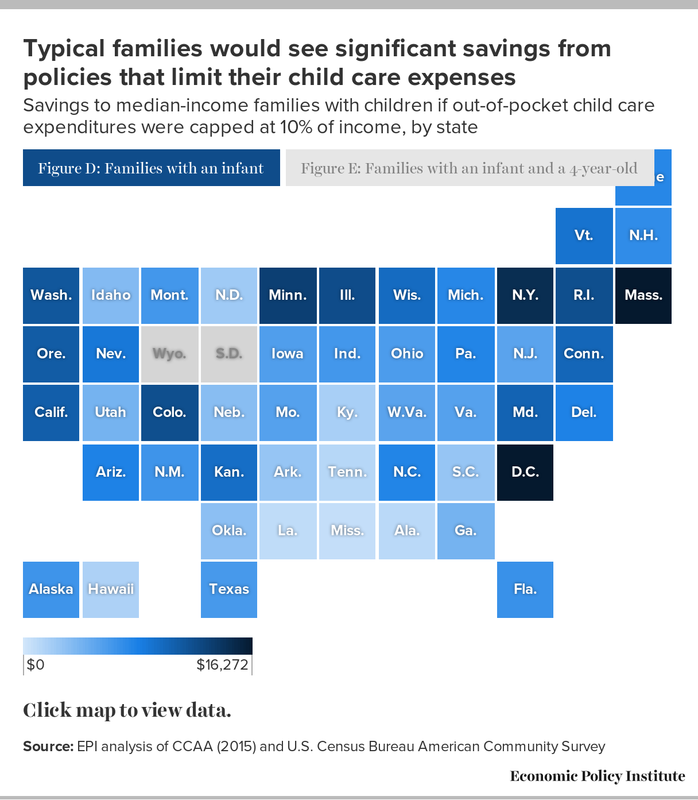 The maps in Figures D and E compare the savings of capping child care costs at 10 percent of family income for both a family with an infant, and a family with an infant and a 4-year-old in full-year care, respectively. The colors of the map represent how much income is freed up by capping child care expenditures. In all but two states, the median family with children would experience savings from such child care reform. For families with only an infant, the savings range from $350 a year in Mississippi to $8,304 in Massachusetts. (Savings in Washington, D.C., are substantially higher, at $16,272; however, we do not include it in our rankings because it is more properly thought of as a city, not a state, and because it has outlier levels of child care costs.) The median savings for this prototypical family ($3,272) is found in New Mexico. It’s important to note that the savings would be even greater with ambitious, quality-oriented child care reform, which has the potential to increase prices as staff quality and investments rise. As expected, capping expenditures at 10 percent of family income for families with two children (an infant and a 4-year-old) would yield even larger savings. They range from $4,289 in South Dakota to $21,085 in Massachusetts. (Washington, D.C., comes in at $34,114 because of its far-higher-than-average child care costs.) The median savings are in Florida (at $11,128), where such child care reform would free up nearly one-third of median family income. While the illustration here considers the cost savings for median families with children (which, on a nationwide basis, have a median income of $63,767), the boost would be even greater for families lower on the income scale. These include single-mother families (which have a median income of $26,374), families headed by an African American (which have a median income of $36,790), and families headed by a Latino or Latina (which have a median income of $41,363). This is because the progressive nature of a cap on child care expenditures as a share of income, by definition, provides greater subsidies to those with lower family income, freeing up a larger share of their income to spend on other needs. For instance, in Kansas, the median state in terms of median family income for families with children ($62,752), families with an infant and a 4-year-old would save $12,877 from a 10 percent cap on child care expenditures. If a Kansas family’s income is half the median ($31,376), the income freed up by the 10 percent cap would be much greater, at $16,014. Helping families afford high-quality child care through generous subsidies would materially improve families’ living standards—particularly for those families that need the most help. A major investment in America’s children would also deliver economic benefits to families—and the economy as a whole—by making it more feasible for parents (particularly mothers) to work. From the widespread lack of paid parental leave to inadequate and unaffordable child care, the United States falls far behind its international peers on a number of measures related to investments in families with children. Without adequate policies to support parents’ ability to remain in the labor force after having children, many parents (mostly mothers) drop out. This has important ramifications for their future work prospects, including their career path and earnings potential, which likewise has implications for their family’s income and well-being. Moreover, lower labor force participation translates directly to lower levels of gross domestic product (GDP). This section surveys the literature regarding links between child care costs and labor force participation and provides illustrative simulations of how better child care policy could lead to better outcomes for parents, families, and the economy. Research has shown that paid parental leave and subsidized child care increase parental labor force participation. Many of our peer nations have such policies, and, not surprisingly, their parental labor force participation rates are much higher than ours. Figure F illustrates just how far U.S. women have fallen behind some of our international peers. 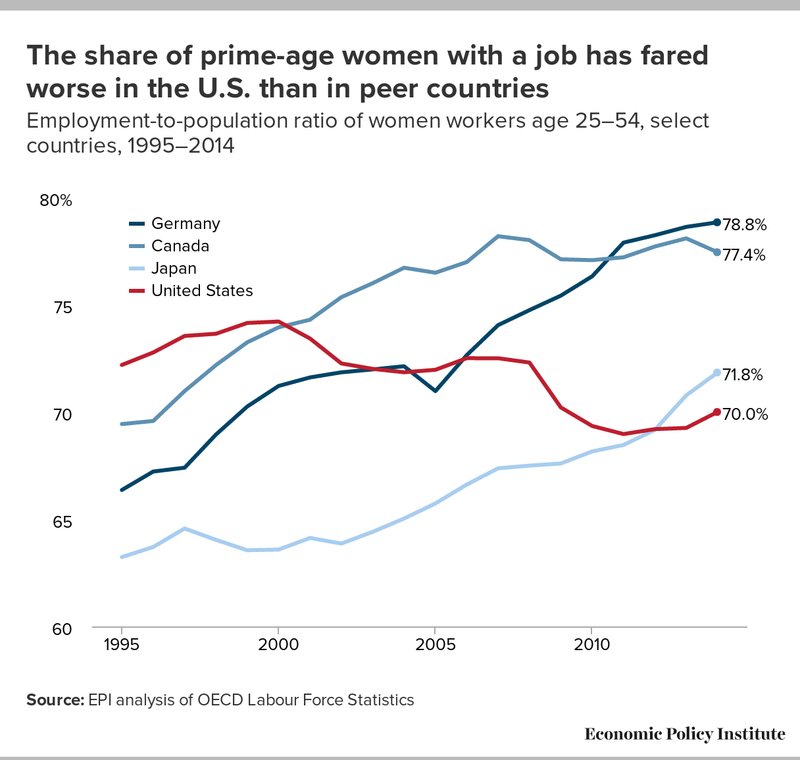 The graph shows the share of women age 25–54 with a job between 1995 and 2014 in Germany, Canada, Japan, and the United States. While the share of prime-age women with a job rose in those peer nations, in the U.S. it actually fell. Policies that help parents, particularly women, balance work and family could meaningfully improve their ability to participate in the labor force. This increase in labor force participation would mean more earnings for families and more economic activity for the country. Blau and Kahn (2013) concur with those findings and also stress that at the same time that U.S. women’s labor force participation went from the sixth highest (out of 22) in 1990 to the 17th highest in 2010, our peer countries outpaced the United States in providing investments and public benefits dedicated to supporting families with children. Ruhm (2011) looks specifically at the relationship between investments in child care and labor force participation, and finds that increasing public child care expenditures from the average of 19 wealthy OECD countries to the level of Denmark would increase labor force participation rates of 25- to 54-year-old women by 4.4 percentage points. An increase of this magnitude would have enormous implications for economic growth. To get a sense of how increasing the share of women in the labor force could affect the economy, consider that if prime-age women had the same labor force participation rate in the United States as in Canada or Germany, there would be roughly 5.5 million more women in the U.S. labor force. All else equal, this would increase GDP by 3.5 percent, representing an additional $600 billion of economic activity (Shierholz 2014). This overall GDP gain would manifest itself as more parents (overwhelmingly women) being able to access paid work, which would lead to higher annual earnings and income for households with children. Some of today’s potential workers who are most constrained from participating in paid labor because of the lack of access to quality child care are single mothers. Relieving this constraint (especially through a policy of progressive transfer) would boost household income and family resources for these households particularly, making it not just good for overall economic growth, but for the equitable distribution of income as well. Allowing heads of low-income, single-parent households to choose paid work knowing that quality child care is available is especially important given that the American system of income supports has shifted so decisively in recent decades toward boosting the returns to work. The earned income tax credit (EITC), for example, now lifts more people out of poverty than any other single government program except for Social Security, and it is only available to those with earnings from the labor market. A number of studies have examined specific policy changes to identify a causal relationship between the cost of child care and parental labor force participation in the United States and abroad. While the price of child care could affect the extent of labor force participation of both men and women, the literature focuses on changes in mothers’ participation (and, to keep our simulations grounded in solid research, we do as well). One prominent study examined the introduction of universal child care in Quebec (Baker, Gruber, and Milligan 2005). They found that each 1 percent increase in subsidies was found to raise maternal labor force participation by 0.24 percent. Lefebvre and Merrigan (2005) found similar results, with every 1 percent decrease in child care costs raising the labor force participation of mothers by 0.25 percent. While U.S. women have increased their labor force participation rate (LFPR) greatly in the last 50 years, substantial gaps between men’s and women’s participation remain. Only 56.8 percent of women participate in the labor force, as compared with 69.1 percent of men. The gender gap in LFPRs is even greater for parents with children under age 18. In 2015, mothers’ LFPR was 69.9 percent, compared with 92.7 percent for fathers.11 A menu of work–family policies ranging from paid family leave to affordable child care could make it easier for women to enter or stay in the labor force. As a result, women’s (i.e., mothers’) labor force participation would increase substantially, helping to close the gender employment gap. Minimizing employment gaps would also help close gender wage gaps. Although the gender pay gap can be measured in numerous ways, one clear way is to examine hourly pay differences. In 2015, the hourly pay of women at the median was 83 percent of men’s. The differences are starker among mothers, who are more likely to work fewer hours and are also more likely to not work for stretches of time. In terms of annual earnings, the pay gap is wider—women earned 78.6 cents for every dollar a man earned in 2014, in part because women work fewer hours on average compared with men (Hegewisch and Hartman 2015). Additionally, there is a sizable penalty for time out of the labor force for women (i.e., mothers with young children). In a study of MBA graduates, Bertrand, Goldin, and Katz (2009) find that career interruptions are costly in terms of future earnings, and women are far more likely to have career interruptions than men. While paid parental leave and making child care affordable can improve gender wage gaps in general, and sometimes to a large degree, other labor market changes should be considered to limit disparities in certain occupations that confer large rewards to those workers willing to put in exceptionally long hours. Goldin (2014) argues that differences in pay are particularly stark among professions that reward long hours of work. As such, mothers in particular may benefit from policies to promote temporal flexibility, which would give them the ability to adjust hours and complete work when it is most convenient given their family obligations. While that temporal flexibility can come at a cost to wages, it would help to remedy gender inequities in the labor market. Consider the child care reform discussed previously whereby child care expenditures would be capped at 10 percent of a family’s income. We evaluate the effect of this change at the median of the income distribution for families with children to get an illustration of the possible magnitude of this reform’s effect on labor force participation. First, for the median family with children, we calculate the percent reduction in child care costs (i.e., the size of the subsidy) that such reform would result in. Then, using the relatively conservative estimate by Blau (2001) that decreasing child care costs by 1 percent increases mothers’ labor force participation by 0.2 percent, we calculate the mothers’ labor force response to this subsidy. Translating this addition to the overall labor force, we then estimate the gains to each state’s economy from such child care reform. In Figure G, we illustrate these gains to each state’s gross state product (GSP) for families with an infant. While the color coding in the map corresponds to the percent increase in GSP, the level increase in each state’s GSP is also provided in the online version of the figure. While the percent increases in GSP are as large as 1.6 percent in several states, the median GSP increase was $1.9 billion in Washington, D.C., and as large as $33.5 billion in California. Across the country, this translates into a GDP increase of 1.2 percent, equal to $210.2 billion. 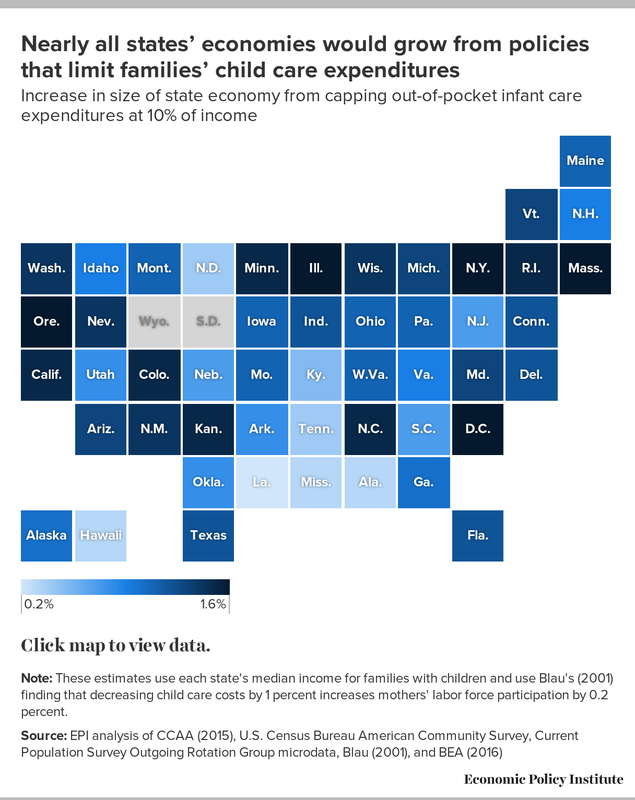 Note: These estimates use each state's median income for families with children and use Blau's (2001) finding that decreasing child care costs by 1 percent increases mothers' labor force participation by 0.2 percent. Using estimates from Bivens and Edwards (2010), we estimate that a GDP gain of this magnitude would boost federal tax revenue by roughly $70 billion annually, providing a very large base of economic support to finance this ambitious investment in America’s children. There is large variation in the outcomes of specific ECCE interventions. To maximize the benefits of these interventions, the design of an ambitious national investment in children should be guided by research findings identifying the characteristics of particularly successful ECCE efforts. One of the clearest findings is the importance of the characteristics of child care providers and staff. Some of the most important characteristics are credentials, schooling, and experience, but other characteristics related to quality are intangible ones, such as energy, enthusiasm, and motivation (Blau 2001). However, the low pay of child care workers presents a severe barrier to attracting the type of workforce at scale that would maximize the benefits of ECCE. Table 1, reproduced from Gould (2015), highlights that child care workers are overwhelmingly female (95.6 percent) and disproportionately workers of color (39.9 percent, versus 33.9 percent for other occupations). In part because of the lingering labor market penalty suffered by women and workers of color, child care workers receive very low hourly pay, many significantly below the state median wage. However, their low pay is not just a function of their demographic characteristics—these workers face a wage penalty even after controlling for relevant worker characteristics. Gould (2015) has documented that the wage penalty for child care workers is 23.0 percent even when compared with demographically similar workers in other occupations. * Race/ethnicity categories are mutually exclusive (i.e., white non-Hispanic, black non-Hispanic, and Hispanic any race). Note: To ensure sufficient sample sizes, this table draws from pooled 2012–2014 microdata. Higher wages for child care workers would also have benefits beyond improving the economic well-being of care providers and their families. Multiple studies of child care quality have shown that higher compensation is correlated with the ability to attract and retain a highly trained workforce—particularly workers who display more of the intangible characteristics associated with high-quality care, and who provide more positive developmental experiences for young children (Whitebook et al. 2001; Center on Children, Families and the Law 2005). Higher compensation has also been shown to contribute to sustainability of quality improvements over time (Whitebook et al. 2001). Higher wages would also provide incentives for child care facilities to invest in the development of their staff, which in turn would improve quality. In a comprehensive longitudinal evaluation of one of the most stunning ECCE successes—the Chicago Child-Parent Program—Reynolds et al. (2011) identified a number of elements crucial to its success. “Highly qualified and well-compensated teachers with bachelor’s degrees and certifications in early childhood education” and “ongoing staff development” were identified as major drivers of this success. This finding that better-compensated teachers are associated with both higher quality and greater levels of employer investment should not come as a shock. Recent studies examining the impact of increases in minimum wages (at either the state or federal level) have come to similar conclusions. Dube, Lester, and Reich (2014) find that minimum-wage increases reduce turnover significantly. Given that provider experience is a key ingredient in ECCE quality, providing a better-paid, more-stable workforce should be a primary goal of any ambitious effort to invest in America’s children. Given the crucial role that provider quality plays in maximizing the return to investments in ECCE, policymakers should ensure that incentives to boost quality and spur investment in ECCE staff and providers are included in any investment effort. One tool to spur quality is to set high reimbursement rates for providers. Higher reimbursement rates to quality providers make them more likely to serve subsidy-receiving households instead of just catering to higher-income families. The federal government currently recommends that states set their reimbursement rates at the 75th percentile of the market rate distribution so that low-income families have access to 75 percent of the providers in their area and to provide incentives for providers to invest in more professional staff. Unfortunately, few states—only one in 2014—actually do so in practice; many states fail to update the rates based on current market surveys. By comparison, 22 states set reimbursement rates at or above 75 percent in 2001. Other tools to spur quality in ECCE staff could include measures to ensure that subsidies can only be used in ECCE facilities that meet high thresholds for staff training and job quality. Through raising child care workers’ wages and pursuing other policies to increase child care quality, we can ensure that investments in ECCE yield the greatest possible benefits. In this section, we describe the current state of child care in America, with a focus on affordability and availability of high-quality care. We also provide a broad overview of the patchwork of policies that help families gain access to child care. Above all, this analysis of the status quo underscores the need for ambitious child care reform. High-quality child care is out of reach for many American families—not just those with low incomes. Child care costs are one of the most significant expenses in a family’s budget, largely because child care and early education is a labor-intensive industry, requiring a low student-to-teacher ratio (CCAA 2014). The heavy burden of child care costs in the context of typical family budgets is illustrated by EPI’s basic family budget thresholds (Gould, Cooke, and Kimball 2015), which measure the income families need in order to attain a modest yet adequate standard of living in 618 communities. Geographical cost-of-living differences are built into the budget calculations by incorporating regional, state, or local variations in prices (depending on item). The thresholds are also adjustable by family type, as expenses vary considerably depending on the number of children in a family (if any), and whether a family is headed by a single parent or two parents. Across regions and family types, child care costs account for the greatest variability in family budgets. Monthly child care costs for a household with one child (a 4-year-old) range from $344 in rural South Carolina to $1,472 in Washington, D.C (Gould and Cooke 2015).14 Child care costs are even higher for families with multiple children; in the District of Columbia, monthly child care costs for a three-child household (with a 4-year-old, an 8-year-old, and a 12-year-old) are $2,784—nearly 90 percent higher than for a household with one child (a 4-year-old). Costs are particularly high for families with infants, due to increased staff sizes and additional training and licensing requirements (CCAA 2014); center-based infant care costs range from $468 a month in Mississippi to $1,868 a month in the District of Columbia. The Department of Health and Human Services has considered child care affordable if it consumes 10 percent or less of a family’s income (HHS 2014). (As previously noted, HHS very recently reduced this threshold to 7 percent.) By this 10 percent metric, in only two states is infant care “affordable”—South Dakota and Wyoming. 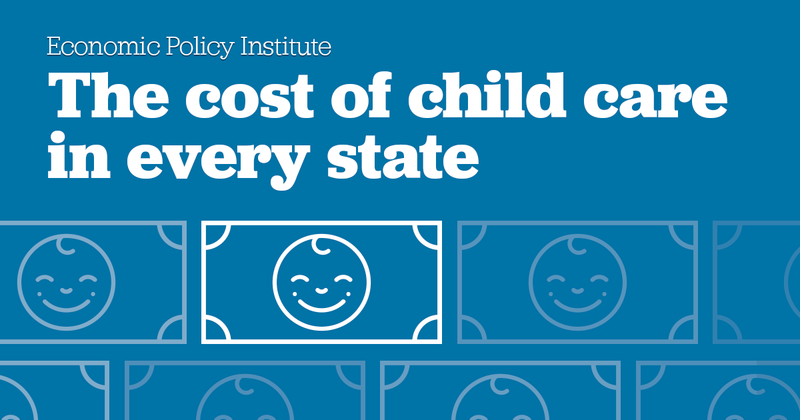 In Massachusetts, which has one of the highest center-based infant care costs, child care costs exceed this affordability test for over 80 percent of families. This is illustrated in Figure H, which depicts the share of families able to afford infant care in each state. Similarly, Figure I displays the share of families in each state able to afford 4-year-old care. Note: Child care is considered affordable if it consumes 10 percent or less of a family's income. Of EPI’s 618 family budget areas, in only a handful of areas (all in Louisiana) are child care costs even close to 10 percent of EPI’s family budget threshold. Center-based child care for single-parent families with two children (ages 4 and 8) ranges from 11.7 percent of a modest yet adequate income in New Orleans to 33.7 percent in Buffalo. Affording child care is particularly difficult for low-wage families. For a full-time, full-year minimum-wage worker, child care costs as a share of income far exceed the HHS affordability standard. For example, the shares of annual minimum-wage earnings required to afford infant care ranges from 31.8 percent in South Dakota to 103.6 percent in Washington, D.C. This expense becomes even further out of reach for families with more than one child requiring care. However, affordable child care is not just a problem for low-income families. For families of four, with two parents and two children (ages 4 and 8), the income level necessary to achieve a modest yet adequate standard of living exceeds state median income in 430 of 618 family budget areas. (Median incomes for families with children under 18 range from $44,717 in Mississippi to $88,627 in New Jersey.) This is due largely to the high cost of child care. Clearly, even middle-income families have great difficulty affording child care. As mentioned previously, child care is even less affordable for families with infants. To illustrate this, we constructed family budgets in 10 areas for two-parent, two-child families with an infant and a 4-year-old (instead of a 4-year-old and an 8-year-old). The areas include San Francisco; Stamford, Connecticut; Tampa, Florida; Atlanta; Chicago; Boston; Detroit; Kansas City, Missouri; Raleigh, North Carolina; and Las Vegas. Annual budgets for these families range from $67,536 in Atlanta (which saw the smallest change in its overall budget when we changed the age of children in the household to include an infant, increasing $3,648) to $108,245 in Stamford. (Boston saw the largest change in its overall budget, increasing $16,921.) Annual child care costs for an infant and a 4-year-old range from $13,245 in Atlanta to $29,478 in Boston. As a share of total family budgets, these child care costs range from 19.3 percent in San Francisco to 28.7 percent in Boston. This compares with a range of 11.8 percent in San Francisco to 21.6 percent in Chicago for families with a 4-year-old and an 8-year-old. In short, families with infants deserve special attention from policymakers. By the time children are age 5, universal schooling helps many families with child care obligations. But before then, and particularly in the first years of children’s lives, too many families are left on their own. As the above estimates show, child care affordability is not just a problem for low-income families, but for many higher-income families as well. There are two major federal vehicles used to offset employment-related child care costs that are available to all families, regardless of income: the child and dependent care tax credit (CDCTC) and the employer-provided child care tax exclusion. The CDCTC allows parents to report up to $3,000 per child in child care costs (up to a maximum of $6,000) and receive a tax credit of 20 to 35 percent, or up to $2,100, based on their adjusted gross income (AGI). Both parents in a two-parent household must be employed in order to receive the credit. The 35 percent credit rate applies to families with AGI below $15,000 and decreases by 1 percentage point for each additional $2,000 of AGI. The 20 percent credit rate applies to families with AGI greater than $43,000. Despite its progressive structure, the federal CDCTC provides little benefit to low-income families because it is non-refundable, meaning families with little or no tax liabilities are unable to receive it. This excludes well over a third of the lowest-income households. Twenty-six states also have child care–related tax provisions, but only 12 include refundable tax credits (NWLC 2014). Tax credits are also less practical for liquidity-constrained low-income families because the benefits are only available when or if a family files an income tax return, rather than at the time the expenses are incurred. According to Blau (2001), one-quarter of the total amount of tax credits claimed in 1997 went to families with AGI of less than $30,000, but almost all of this amount was claimed by families with AGI between $15,000 and $30,000; only 1.8 percent was claimed by families with AGI less than $15,000. This suggests that those most likely to qualify for the maximum benefit of $2,100, such as single-parent minimum-wage workers, rarely actually get it. The largest average benefits go to those with incomes between $100,000 and $200,000 because their expenses are higher than those of other income groups and because more people in this income range have child care expenses (Maag 2013). The employer-provided child care tax exclusion is available to any worker employed at a firm that offers this benefit. It allows an employee to exclude from taxation up to $5,000 of her salary, regardless of the number of children receiving care. Since these are pre-tax dollars, higher-income families typically benefit more from the exclusion than from the tax credit because they save both on income and payroll taxes. Families can claim both the CDCTC as well as the child care exclusion, but total expenses claimed cannot exceed $6,000. Although most working families will only receive a fraction of this amount in actual tax benefits, $6,000 covers the average cost of infant care in only six states, and the average cost of child care for a 4-year-old in 11 states.15 At the other end of the spectrum, average infant care costs in the District of Columbia are nearly four times the total allowable expenses under federal child care tax provisions. In addition to limitations on the amount of allowable expenses and the number of families who benefit from these tax provisions, the value of these provisions erodes each year because they are not indexed to inflation. Child care subsidies are the primary vehicle for making more options for higher-quality child care available to low-income families who generally do not benefit from non-refundable tax credits. The Child Care Development Fund (CCDF), authorized under the Child Care and Development Block Grant Act (CCDBG), is the primary source of federal funding for child care subsidies for low-income working families. Other funding sources for child care assistance include the federal Temporary Assistance for Needy Families (TANF) funding and Social Services Block Grant (SSBG), along with other state funds. Program rules can have significant and sometimes conflicting effects on the affordability and quality of child care available to low-income families. The National Women’s Law Center publishes an annual report with detailed information on state child care assistance policies. Findings from their 2015 report are summarized in Table 2. Income eligibility limits are a clear shortcoming of current child care subsidies. These eligibility limits are used to determine how far up the income scale access to child care subsidies extend. The higher the limit, the more families potentially have access to child care assistance, assuming they also meet the other requirements. In 2015, income eligibility limits for a family of three ranged from $23,880 in Michigan to $61,524 in North Dakota (Schulman and Blank 2015). In all states, a family of three with income below the federal poverty threshold ($20,090 for a family of three) could qualify for assistance in 2015. About two-thirds of states offer assistance to families with income up to 150 percent of the poverty threshold ($30,135 for a family of three), but less than one-fourth offer assistance to families with income up to 200 percent of the poverty threshold ($40,180 for a family of three). But as we demonstrated previously in our review of child care affordability, this means many families with incomes substantially above the poverty line that nevertheless face severe stress in affording quality child care do not benefit from these subsidies. Waiting lists are used to manage excess demand for child care assistance by qualified families. States may also opt to freeze intake, meaning qualified families are turned away without even being placed on a waiting list. Average time spent on a waiting list can vary by state, but ranged from one to two months in one state to between 18 months and two years in another (Schulman and Blank 2015). Eligible families with an immediate need for child care are often forced to seek other options or risk losing a job. Copayments are the portion of the total cost of child care a family must pay out of pocket. These copayments have generally increased over time. Among states that required a copayment in 2015, more than half required copayments that were a higher percentage of income than what was required in 2001. Based on the 10 percent HHS affordability standard, required copayments were unaffordable for a family of three with an income at 150 percent of poverty in nine states (Schulman and Blank 2015). 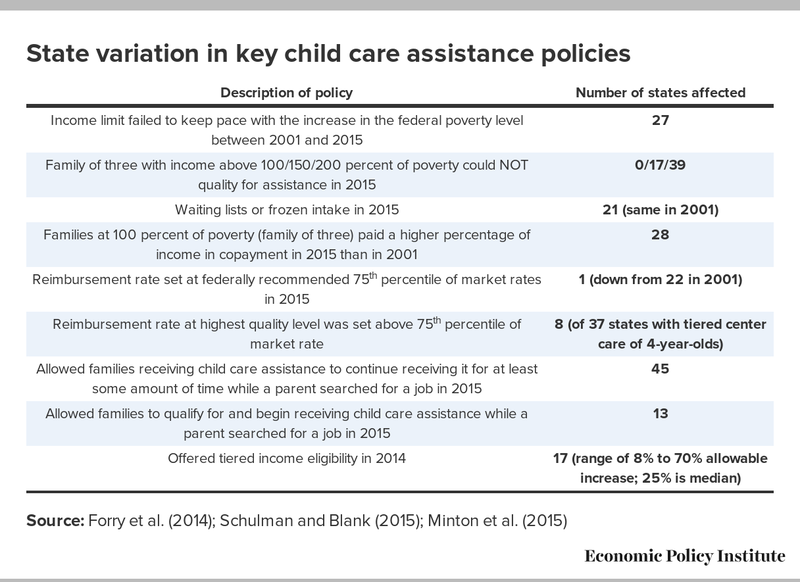 While all but five states allow families receiving child care assistance to continue receiving it for at least some amount of time while a parent searched for a job in 2014, the amount of time allowed varies by state. Only 14 states allowed families to qualify for and begin receiving child care assistance while a parent searched for a job. Eligibility redetermination periods establish the frequency with which a family’s eligibility for child care assistance is reassessed. In most cases these periods are between six and 12 months. A family’s ongoing eligibility has a major impact on the continuity of care. A family can lose eligibility if parents are no longer engaged in an approved activity (i.e., working, searching for work, or engaging in education or training) or if their income rises above the established income eligibility limit. In 2014, 17 states had tiered eligibility limits, allowing a higher income limit at redetermination than initial eligibility. This permits a family to continue receiving assistance while their income grows. In most states the allowable increase is modest, with a median increase of 24 percent in 2014 (Forry et al. 2014). Among states with tiered eligibility in 2014, the lowest allowable increase was 8 percent in Wisconsin, and the highest was 70 percent in Massachusetts. The other consequence of this patchwork system of state rules is that certain racial or ethnic groups may be disproportionately impacted by various policies, depending on population distribution and the racial distribution of children served in a state. Nationally, African American and white children made up nearly equal percentages of children served through CCDF funding in fiscal 2014 (42 percent and 41 percent, respectively). Latino children (includes all races) were 21 percent of those served. However, the racial distribution of children served varies across states. African American children were as much as 91 percent of those served in Mississippi, and Latino children were the highest share of children served in New Mexico (77 percent). White children are 95 percent of those served in Idaho. Program rules regarding approved activities for eligibility may be more likely to qualify different groups, based on their unique circumstances. For example, employment is an approved activity in all states, but searching for a job is not. In 2014, of the 20 states where the black unemployment rate was higher than the average national black unemployment rate (11.4 percent), six did not consider searching for a job an eligible activity at any time—including when a parent loses a job—and seven more didn’t allow families to qualify during an initial job search. Since the black unemployment rate in those states is also more than double the white rate, excluding searching for a job as an eligible activity would be more of a barrier to access or continuity of care for low-income African American families. Affordability and availability of high-quality child care are closely related because with the exception of a few publicly funded programs, most parents pay out of pocket for some portion of child care costs (including preschool or pre-kindergarten). However, even publicly funded programs that offer free care manage to provide high-quality care to only a fraction of their targeted population. For example, Head Start offers free high-quality early care and education services to young children in poverty, but reaches less than half of eligible preschool-age children. Early Head Start reaches less than 5 percent of eligible infants and toddlers (NWLC 2015). Forty states and the District of Columbia funded pre-kindergarten programs in the 2013–2014 school year, but these programs reached only 29 percent of 4-year-olds and 4 percent of 3-year-olds. In addition, only five states funded pre-kindergarten programs that met all 10 of the key quality benchmarks identified by the National Institute for Early Education Research (NWLC 2015). While all parents are challenged with finding the best quality of care available and affordable to them, options for parents with non-standard work schedules are even more limited. These are parents who work evenings, overnight shifts, on the weekends, or have varying work schedules that change from week to week or month to month. This group is primarily served by home-based providers who are much more likely to offer evening, overnight, or weekend care than child care centers. According to the National Survey of Early Care and Education, only 8 percent of center-based providers are open anytime during evenings, overnight, or weekends, compared with 82 percent of unlisted, unpaid home-based providers, 63 percent of unlisted, paid home-based providers, and 34 percent of listed17 home-based providers (NSECE 2015).18 Providers of all types are more likely to provide care overnight or on weekends than during evenings. Although child care centers are less likely to provide care during non-standard hours, those that do tend to offer more hours of care than home-based providers. Parents who face irregular work schedules—such as nurses and retail and fast food workers—also face the challenge of finding providers who are willing to be flexible with respect to when their children can use care or that allow them to pay only for the care they use. While these arrangements are beneficial to parents, they often create uncertainty for providers, who need to coordinate staffing and maintain a consistent and predictable stream of income. Parents with irregular work schedules often earn income low enough to qualify for child care subsidies, but have problems accessing child care assistance due to policies that are structured for parents with standard work schedules. Despite these positive steps to improve the availability of higher-quality child care, one of the biggest challenges with the new law is that it is not accompanied with a guarantee of significant new federal funds, unlike the past two reauthorizations in 1990 and 1996. As a result, states will be challenged with having to make difficult tradeoffs in order to meet the new objectives (Matthews et al. 2015). The new CCDBG reauthorization includes a number of provisions that give states greater flexibility in meeting the needs of families with non-standard schedules. These include increasing the supply of providers who offer care during non-standard work hours, expanding access to child care for families whose work schedules and income fluctuate, and improving payment practices for providers who accommodate parents with irregular work schedules. The law also requires that new health and safety standards be applied to a wider array of providers, including license-exempt providers who are more likely to provide care during non-standard hours. States must do what they can to minimize the burden on these providers, so as not to restrict the availability of care for parents working non-standard hours. While there are non-trivial efforts aimed at providing affordable ECCE interventions to American children, the system has become wholly insufficient to address the realities of 2016 family economics. Child care affordability is not just a problem for low-income families, and policy should adapt to this. Further, even the admirable ECCE efforts aimed at lower-income families (such as Head Start) have become too uneven in quality and need further investments to live up to their potential. Finally, innovations that have become commonplace in our advanced industrial peer countries (provision of universal affordable child care through subsidies and extensive pre-kindergarten programs) have not yet arrived in the United States. All of this should be addressed with a major investment in America’s families with children that patches holes and creates needed new institutions in our national system of ECCE. Resources invested in childhood development and education vary enormously and predictably across income classes. These gaps in resource investment lead to gaps in school readiness—gaps that persist over students’ lifetimes. These school achievement gaps then translate into large gaps in later life success. As distressing as these gaps should be for those committed to basic equality of opportunity, they do provide an enormous potential opportunity to improve economic mobility as well as overall economic performance. But this potential opportunity can only be realized if we are prepared to make an ambitious national investment in America’s children—investments aimed at providing higher-quality development and educational opportunities for all children from birth. This report has demonstrated that such a national investment could pay off in a number of ways. In the aggregate, such an investment would even pay off in narrow budgetary terms, making it a “free lunch” to fiscal policymakers so long as they were willing to wait a decade or so for the returns to begin arriving. This report has also demonstrated that the current patchwork of American policy aimed at aiding families in finding high-quality, affordable child care is deeply flawed. Nonrefundable tax credits leave many low-income families ineligible for these credits. Direct subsidies for low-income households are too narrow in eligibility, leaving too many economically stressed families behind. Worse, these subsidies are slowly withering, and are of little use to the growing number of workers with non-standard schedules. Wait lists and insufficient space in Head Start and Early Head Start programs prevent them from fully meeting the needs of the intended population. The upside of this current patchwork is that financing a truly ambitious set of investments in America’s children could be partially paid-for by rolling up some of these programs into the new investments. But these investments are worth undertaking even if all new financing had to come from scratch. They are worth it in the aggregate benefits they would provide the economy (and even government budgets), they are worth it in terms of the greater economic mobility they would allow, and they are worth it for the help they would provide working families in balancing work and family. Emma García joined the Economic Policy Institute as an economist in 2013. She specializes in the economics of education and education policy. Her areas of research include analysis of the production of education, returns to education, program evaluation, international comparative education, human development, and cost-effectiveness and cost-benefit analysis in education. Prior to joining EPI, García conducted research for the Center for Benefit-Cost Studies of Education and other research centers at Teachers College, Columbia University, and did consulting work for MDRC, the Inter-American Development Bank, and the National Institute for Early Education Research. García has a Ph.D. in Economics and Education from Teachers College, Columbia University. Elaine Weiss has served as the national coordinator for the Broader, Bolder Approach to Education (BBA) since 2011, in which capacity she works with four co-chairs, a high-level task force, and multiple coalition partners to promote a comprehensive, evidence-based set of policies to allow all children to thrive. Elaine came to BBA from the Pew Charitable Trusts, where she served as project manager for Pew’s Partnership for America’s Economic Success campaign. Ms. Weiss was previously a member of the Centers for Disease Control and Prevention’s task force on child abuse, and served as volunteer counsel for clients at the Washington Legal Clinic for the Homeless. She holds a Ph.D. in public policy from The George Washington University and a J.D. from Harvard Law School. Valerie Wilson is director of the Economic Policy Institute’s Program on Race, Ethnicity, and the Economy (PREE), a nationally recognized source for expert reports and policy analyses on the economic condition of America’s people of color. Prior to joining EPI, Wilson was an economist and vice president of research at the National Urban League Washington Bureau, where she was responsible for planning and directing the bureau’s research agenda. She has written extensively on various issues impacting economic inequality in the United States—including employment and training, income and wealth disparities, access to higher education, and social insurance—and has also appeared in print, television, and radio media. She has a Ph.D. in economics from the University of North Carolina at Chapel Hill. 1. These include the Nurse Family Partnership and the Infant Health and Development Program. 2. Examples of these high-quality preschool programs include the Perry Preschool Program, Abecedarian Project, Early Training Project, Chicago Parent-Child Program, the Elmira Prenatal/Early Infancy Project, The Milwaukee Project, NC Smart Start, and More at Four, among many others. 3. Participation also provided large benefits to the mothers. 4. Individual studies show a variety of effects on social and emotional skills: The most recent Oklahoma study finds gains in social emotional skills, on reducing timidity and increasing attentiveness. At the same time, there seems to be the potential for poor-quality programs to result in increased behavior problems (Magnuson, Ruhm, and Waldfogel 2007). Indeed, Heckman and colleagues suggest that these early gains in so-called noncognitive skills drive many of the lasting gains we see in other domains (Heckman, Stixrud, and Urzua 2006). 5. It meets eight of the 10 NIEER quality standards (Barnett et al. 2015). 6. For the 2001–2002 cohort, however, effects on math and reading test scores had vanished by 3rd grade (a phenomenon sometimes referred to as “fadeout”). For the 2006–2007 cohort, however, there were persistent effects on math scores of 0.18 standard deviations (there were no persistent effects in reading). 7. The program’s quality has significantly improved “using essentially the same programs (2/3 private) and teachers—though many teachers went back to school for degrees and specialized training in return for higher pay, all received coaching” (NIEER 2013). 8. Number of felonies by type and gender are reported in Table A2 (Nores et al. 2005). 9. An expansion of these benefits also considers the non-negligible costs saved to the potential crime victims. See Heckman et al. (2010) and Reynolds et al. (2011). 10. Bartik (2014) also points to a few shorter-term impacts that are rarely noted, such as increased property values in areas in which public pre-kindergarten programs are established. 11. EPI analysis of 2015 CPS microdata. 12. Blau and Hagy (1998) examine differences in child care prices and their relationship with child care demand and labor supply of parents, among other outcomes. They estimate an elasticity of employment with respect to the price of child care of -0.20. In other words, decreasing child care costs by 1 percent increases mothers’ labor force participation by 0.2 percent. In a recent White House paper on the economics of early childhood investments, researchers cite elasticity estimates ranging from -0.05 to 0.40. They also find that single mothers’ work decisions appear particularly responsive to changes in child care costs. In our estimates, we use the -0.20 elasticity, following the relatively conservative estimate discussed in Blau (2001), and used for similar purposes by Bartik (2006) in his analysis of the Chicago Child-Parent Center, and by Lynch and Vaghul (2015) in their analysis of the benefits of a hypothetical universal pre-kindergarten program. 13. EPI analysis of pooled Current Population Survey Outgoing Rotation Group microdata, 2013–2015. 14. In EPI’s family budgets, child care costs in metropolitan areas—which constitute over 90 percent of our family budget areas—are statewide averages of the cost of center-based care. (For rural areas, which may not have easy access to center-based care, the budgets assume family-based care.) Although center-based care varies in quality, it serves as the standard for child care costs in the vast majority of our budget areas because it is the predominant form of child care (CCAA 2014). 15. EPI analysis of cost estimates from CCAA (2014). 16. Currently, only Nebraska and Rhode Island use any sort of assets test. 17. “Listed” individuals appear on state or national lists of early care and education services, such as licensed, regulated, license-exempt, or registered home-based providers. 18. These data come from interviews completed in 2012 with 5,240 home-based providers and 7,770 center-based providers providing care to at least one child birth through age 5, not yet in kindergarten. Baker, Michael, Jonathan Gruber, and Kevin Milligan. 2005. Universal Childcare, Maternal Labor Supply and Family Well-Being. National Bureau of Economic Research, Working Paper No. 11832. Barnett, W. Steven. 2008. Preschool Education and Its Lasting Effects: Research and Policy Implications. National Institute for Early Education Research at Rutgers University. Barnett, W. Steven, and Milagros Nores. 2015. “Investment and Productivity Arguments for ECCE.” In P.T.M. Marope and Y. Kaga (eds), Investing against Evidence: The Global State of Early Childhood Care and Education, UNESCO. Barnett, W. Steven, K. Jung, M. Youn, and E.C. Frede. 2013. Abbott Preschool Program Longitudinal Effects Study: Fifth Grade Follow-Up. National Institute for Early Education Research. Barnett, W. Steven, M.E. Carolan, J.H. Squires, K. Clarke Brown, and M. Horowitz. 2015. The State of Preschool 2014: State Preschool Yearbook. National Institute for Early Education Research. Bartik, Timothy J. 2006. Taking Preschool Education Seriously as an Economic Development Program: Effects on Jobs and Earnings of State Residents Compared to Traditional Economic Development Programs. Report prepared for the Committee for Economic Development. Bartik, Timothy J. 2014. From Preschool to Prosperity: The Economic Payoff to Early Childhood Education. W.E. Upjohn Institute for Employment Research. Belfield, Clive R., Milagros Nores, W. Steven Barnett, and Lawrence Schweinhart. 2006. “The High/Scope Perry Preschool Program: Cost-Benefit Analysis Using Data from the Age-40 Followup.” The Journal of Human Resources, vol. 41, no. 1, 162–190. Bertrand, Marianne, Claudia Goldin, and Lawrence F. Katz. 2009. Dynamics of the Gender Gap for Young Professionals in the Corporate and Financial Sectors. National Bureau of Economic Research, Working Paper No. 14681. Bivens, Josh, and Kathryn Edwards. 2010. Cheaper Than You Think—Why Smart Efforts to Spur Jobs Cost Less Than Advertised. Economic Policy Institute, Policy Memorandum #165. Black, Sandra E., Paul J. Devereux, and Kjell G. Salvanes. 2011. “Too Young to Leave the Nest? The Effects of School Starting Age.” The Review of Economics and Statistics, vol. 93, no. 2, 455–467. Blau, David. 2001. The Child Care Problem: An Economic Analysis. Russell Sage Foundation. Blau, David M., and Alison P. Hagy. 1998. “The Demand for Quality in Child Care.” Journal of Political Economy, vol. 106, no. 1, 104–146. Blau, Francine D., and Lawrence M. Kahn. 2013. Female Labor Supply: Why is the US Falling Behind? National Bureau of Economic Research, Working Paper No. 18702. Camilli, G., S. Vargas, S. Ryan, and W.S. Barnett. 2010. “Meta-Analysis of the Effects of Early Education Interventions on Cognitive and Social Development.” The Teachers College Record, vol. 112, no. 3. Center on Children, Families and the Law. 2005. Compensation of Early Childhood Teachers: What Value Do We Place on Young Children? Council of Economic Advisers. 2014. The Economics of Early Childhood Investments. Dube, Arindrajit, T. William Lester, and Michael Reich. 2014. Minimum Wage Shocks, Employment Flows and Labor Market Frictions. IRLE Working Paper No. 149-13. Duncan, Gregory J., and Richard Murnane. 2011. “Introduction: The American Dream, Then and Now.” In Greg J. Duncan and Richard Murnane (eds. ), Whither Opportunity: Rising Inequality, Schools, and Children’s Life Chances. Russell Sage Foundation. Duncan, Greg J., and Katherine Magnuson. 2013. “Investing in Preschool Programs.” The Journal of Economic Perspectives, vol. 27, no. 2, 109–132. Forry, Nicole, Paula Daneri, Sarah Minton, and Christin Durham. 2014. Supporting Continuity through Child Care and Development Fund Subsidies: A Review of Select State Policies. OPRE Research Brief No. 2014-32. García, Emma. 2015. Inequalities at the Starting Gate: Cognitive and Noncognitive Gaps Among the 2010–2011 Kindergarten Cohort: Economic Policy Institute. Goldin, Claudia. 2014. “A Grand Gender Convergence: Its Last Chapter.” American Economic Review, vol. 104, no. 4, 1091–1119. Gormley, William, Deborah A. Phillips, and Ted Gayer. 2008. “Preschool Programs Can Boost School Readiness.” Science, vol. 320, 1723–1724. Gould, Elise. 2015. Child Care Workers Aren’t Paid Enough to Make Ends Meet. Economic Policy Institute, Issue Brief #405. Gould, Elise, and Tanyell Cooke. 2015. High Quality Child Care is Out of Reach for Working Families. Economic Policy Institute, Issue Brief #404. Gould, Elise, Tanyell Cooke, and Will Kimball. 2015. What Families Need to Get By: EPI’s 2015 Family Budget Calculator. Economic Policy Institute, Issue Brief #403. Heckman, James J. 2008. “Schools, Skills, and Synapses.” Economic Inquiry, vol. 46, no. 3, 289–324. Heckman, James J., and Tim Kautz. 2012. “Hard Evidence on Soft Skills.” Labour Economics, vol. 19, no. 4, 451–464. Heckman, James J., J. Stixrud, and Sergio Urzua. 2006. “The Effects of Cognitive and Noncognitive Abilities on Labor Market Outcomes and Social Behavior.” Journal of Labor Economics, vol. 24, no. 3, 411–482. Heckman, James J., Seong Hyeok Moon, Rodrigo Pinto, Peter A. Savelyev, and Adam Yavitz. 2010. “The Rate of Return to the HighScope Perry Preschool Program.” Journal of Public Economics, vol. 94, nos. 1–2, 114–128. Hegewisch, Ariana, and Heidi Hartmann. 2015. The Gender Wage Gap: 2014. Institute for Women’s Policy Research, Publication No. C433. Hill, Carolyn J., William T. Gormley Jr., and Shirley Adelstein. 2015. “Do the Short-Term Effects of a High-Quality Preschool Program Persist?” Early Childhood Research Quarterly, vol. 32, 60–79. Ladd, Helen F., Clara G. Muschkin, and Kenneth A. Dodge. 2014. “From Birth to School: Early Childhood Initiatives and Third‐Grade Outcomes in North Carolina.” Journal of Policy Analysis and Management, vol. 33, no. 1, 162–187. Leak, James, G. Duncan, Weilin Li, Katherine Magnuson, Holly S. Schindler, Hirokazu Yoshikawa, and Jack P. Shonkoff. Forthcoming. Timing in Early Childhood Education: How Program Impacts on Cognition and Achievement Vary by Starting Age, Program Duration, and Time Since the End of the Program. Lefebvre, Pierre, and Philip Merrigan. 2005. Low-Fee ($5/Day/Child) Regulated Childcare Policy and the Labor Supply of Mothers with Young Children: A Natural Experiment from Canada. CIRANO Working Papers 2005s-08. Lynch, Robert, and Kavya Vaghul. 2015. The Benefits and Costs of Investing in Early Childhood Education: The Fiscal, Economic, and Societal Gains of a Universal Prekindergarten Program in the United States. Washington Center for Equitable Growth. Maag, Elaine. 2013. “Taxation and the Family: How Does the Tax System Subsidize Child Care Expenses?” In The Tax Policy Briefing Book. Urban-Brookings Tax Policy Center. Magnuson, Katherine A., Christopher Ruhm, and Jane Waldfogel. 2007. “Does Prekindergarten Improve School Preparation and Performance?” Economics of Education Review, vol. 26, no. 1, 33–51. Matthews, Hannah, Karen Schulman, Julie Vogtman, Christine Johnson-Staub, and Helen Blank. 2015. Implementing the Child Care and Development Block Grant Reauthorization: A Guide for States. National Women’s Law Center. McKinsey and Company. 2009. The Economic Impact of the Achievement Gap in America’s Schools. Minton, Sarah, Kathryn Stevens, Lorraine Blatt, and Christin Durham. 2015. The CCDF Policies Database Book of Tables: Key Cross-state Variations in CCDF Policies as of October 1, 2014. OPRE Report #2015-95. National Center for Education Statistics (NCES) (U.S. Department of Education). Early Childhood Longitudinal Study, Kindergarten Class of 2010–11 (ECLS-K:2011). Restricted-Use Data File. National Women’s Law Center (NWLC). 2014. State Child and Dependent Care Tax Provisions, Tax Year 2014. National Women’s Law Center (NWLC). 2015. Gaps in Support for Early Care and Education. Nores, Milagros, Clive R. Belfield, W. Steven Barnett, and Lawrence Schweinhart. 2005. “Updating the Economic Impacts of the High/Scope Perry Preschool Program.” Educational Evaluation and Policy Analysis, vol. 27, no. 3, 245–261. Reynolds, A.J., J.A. Temple, D.L. Robertson, E.A. Mann. 2002. “Age 21 Cost-Benefit Analysis of the Title I Chicago Child-Parent Centers.” Educational Evaluation and Policy Analysis, vol. 24, no. 4, 267–303. Reynolds, A. J., J.A. Temple, B.A. White, S. Ou, and D.L. Robertson. 2011. “Age-26 Cost-Benefit Analysis of the Child-Parent Center Early Education Program.” Child Development, vol. 82, no. 1. Rolnick, A., and R. Grunewald. 2003. “Early Childhood Development: Economic Development with a High Public Return.” The Region, vol. 17, no. 4, 6–12. Ruhm, Chistopher J. 2011. “Policies to Assist Parents With Young Children.” Future Child, vol. 21, no. 2, 37–68. Schindler, H.S., J. Kholoptseva, S. Oh, H. Yoshikawa, G.J. Duncan, K.A. Magnuson, and J.P. Shonkoff. 2015. “Maximizing the Potential of Early Childhood Education to Prevent Externalizing Behavior Problems: A Meta-Analysis.” Journal of School Psychology, vol. 53, no. 3, 243–263. Schulman, Karen, and Helen Blank. 2015. Building Blocks: State Child Care Assistance Policies 2015. National Women’s Law Center. Shierholz, Heidi. 2014. “Paid Leave Is Good for Business.” U.S. Department of Labor Blog, December 19. Shonkoff, J.P., and D.A. Phillips. 2000. From Neurons to Neighborhoods: The Science of Early Childhood Development. Washington, DC: National Academies Press. U.S. Bureau of Economic Analysis (BEA). 2016. “Gross Domestic Product (GDP) by State (Millions of Current Dollars),” February. U.S. Department of Health and Human Services (HHS). 2014. “Fun”damentals of CCDF Administration. Whitebook, Marcy, Laura Sakai, Emily Gerber, and Carollee Howes. 2001. Then and Now: Changes in Child Care Staffing, 1994-2000. Center for the Child Care Workforce. Wong, Vivian C., Thomas D. Cook, W. Steven Barnett, Kwanghee Jung. 2008. “An Effectiveness-Based Evaluation of Five State Pre-Kindergarten Programs.” Journal of Policy Analysis and Management, vol. 27, 122–154.